The suits are pressed and the jets are gassed up, as global political and business leaders prepare to converge in Davos for the World Economic Forum. 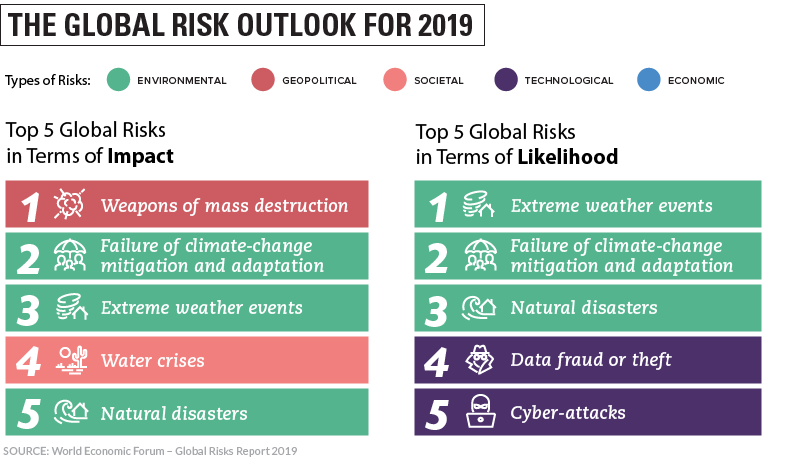 To prep the wide variety of world leaders attending the summit, the organization has just published its most recent edition of the Global Risks Report. The highly anticipated annual presentation puts the world’s most pressing issues into focus, giving a sense of what is top-of-mind for global decision-makers. Below are the top five risks highlighted in this year’s report. And over recent years, it’s clear that the composition of these top threats has evolved. In 2009, the world was still reeling from the global financial crisis, so economic concerns were naturally at the forefront of discussions. Today, the most likely scenarios to play out in the near future involve extreme weather events and natural disasters. Also trending upward are cyber-security threats and concerns over the security of personal data. 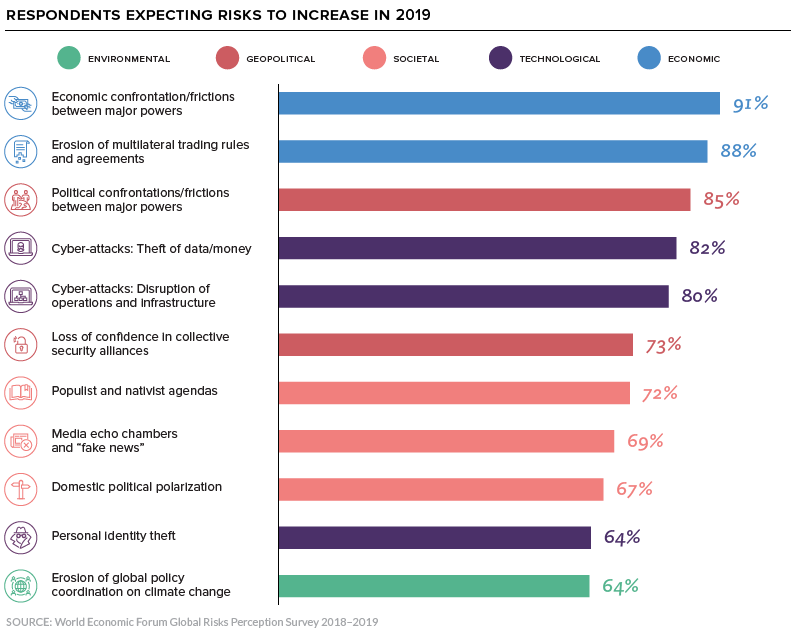 Each year, the Global Risks Perception Survey looks at which risks are viewed by global decision-makers as increasing in the coming year. From trade wars to the dissolution of weapons treaties, cooperation between countries is on the decline. Leaders are concerned that this divergent geopolitical climate may continue to inhibit collective progress on important global challenges. As the influence of technology creeps into more aspects of everyday life, cyber-attacks and lax cybersecurity protocols are becoming more of a concern. In one dramatic example information theft, multiple breaches of India’s government ID database reportedly left the information of over 1 billion registered citizens exposed. Technology is influencing society in other ways too, such as the pervasive issue of “fake news”. One of the major themes of this year’s forum will be addressing increasing polarization in many countries. Where opposing political groups previously expressed frustration with each other, they now express fear and anger.